The Model 601 Standpipe Piezometer is designed to provide a filtered inlet point when it is placed within a drilled hole. 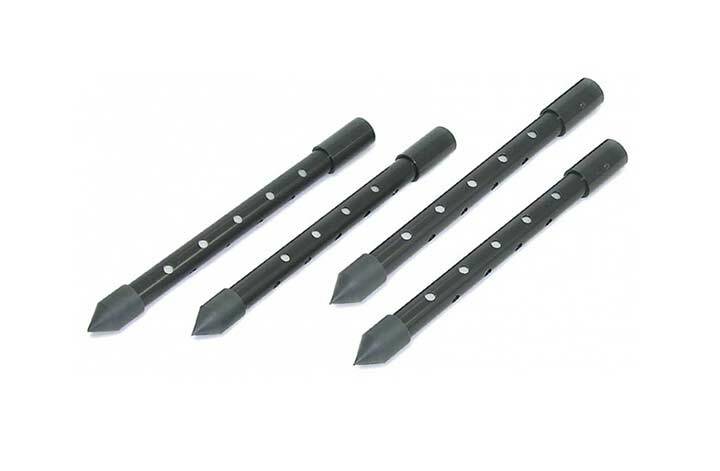 Its pointed PVC tip makes it ideal for pushing into very loose sands at the base of a borehole, a stream or into loose tailings pond sediments. It is composed of a pre-formed porous polyethylene tube set inside a perforated PVC Piezometer tip which makes it excellent for metals sampling. It is ideally suited for water level monitoring, de-watering drainage operations, permeability measurements, and construction control and slope stability investigations. 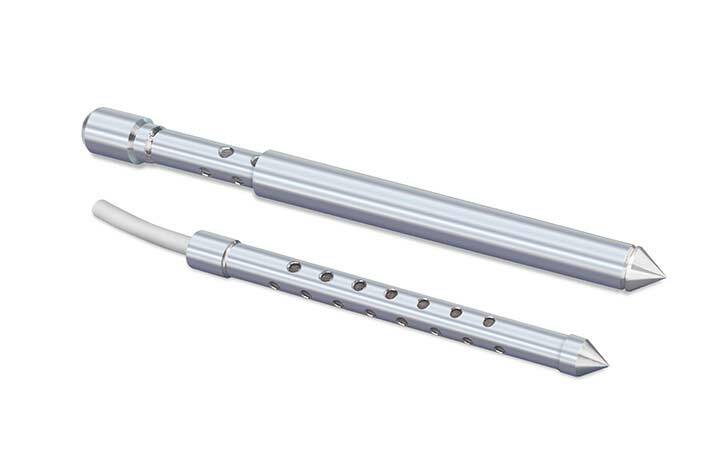 The Standpipe Piezometer tip connects to the surface with 3/4” ID PVC riser pipe using slip-fit couplings. It can also be used to connect to other sizes of riser pipe or casing if reducer couplings are used. The standard 601 tip lengths available are: 15 cm, 30 cm, 60 cm and 90 cm (6”, 1 ft, 2 ft and 3ft). 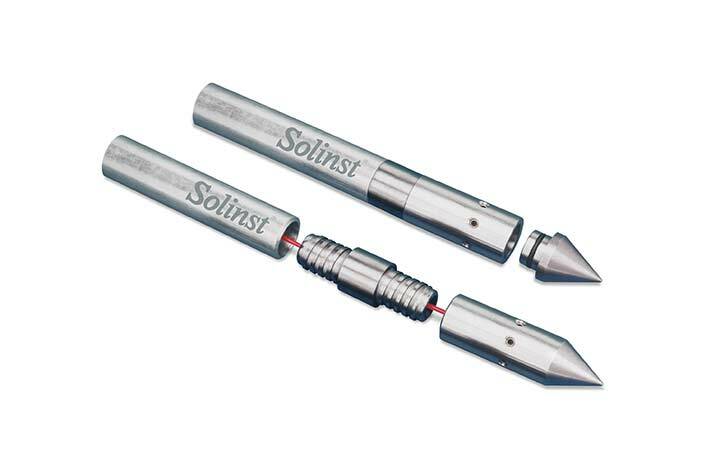 For applications with a need for the Piezometer to be pushed into the soil below the bottom of a borehole, Solinst offer the Model 615 stainless steel Drive-Point Piezometer. This can also be driven directly into the ground from the surface. The Model 615 Drive-Point Piezometers use a high quality stainless steel Piezometer tip, 3/4" NPT pipe for drive extensions and LDPE or PTFE/FEP sample tubing, if desired. Combine these with an inexpensive Slide Hammer and you have a complete system. The Model 660 Drive-Point Profiler is designed to be a preliminary site assessment tool enabling the collection of groundwater samples from multiple points in a single drive/drilling location, at discrete zones. How do you install direct push equipment? How far can direct-push equipment reach? 660 Drive-Point Profilers – Typically the limit is 9m below the water surface. 615 Drive-Point Piezometers – Typically 2-3m in loose deposits. 601 Standpipe Piezometers – Can go as deep as required. What are the screen options for piezometers? 615 Drive-Point Piezometers – Screened tips available in 6” and 1ft lengths. Can have a compression fitting, hose barb, or no barb as well as shielded options. 601 Standpipe Piezometers – Screened tips are available in 6”, 1ft, 2ft, and 3ft. These use a Vyon® filter. What monitoring instruments can be used in the 615 and 601 piezometers? A 1” to ¾” stainless steel reducer coupling to install a Levelogger in a 1” drive extension section. Which direct push equipment is reusable or removable? The 601 and 615 are designed for permanent monitoring. So, neither are reusable, but the 615 can pulled out mechanically. However, grouting is the most favourable method of decommission on both of these pieces of equipment. The 660 Drive-point Profiler is a short-term monitoring point, therefore the hole left behind can be easily grouted using a grout tip Drive-point profiler. What are the typical depths that Drive-point piezometers can be installed to? The depth that these can be installed to depends on the material in which they are being installed in. Typically, you will get a deeper installation in peat over other ground materials.